Hillary Clinton is making the rounds in every corner of the good ol' U.S. of A., and one of her most recent stops was at Lebanon, New Hampshire, where she encountered all sorts of characters during her campaign trip. One unidentified fellow stirred up some deep rumblings online after her official Twitter account on Tuesday tweeted and then deleted a photo of Clinton shaking hands with a white man whose forearm sported a very visible "white" tattoo. Now, we don't necessarily know what the "white" tattoo actually stands for, but I mean, I'm pretty sure the guy's tat doesn't have to do with his undying love for Breaking Bad's Walter White. The now deleted photo was captioned with, "I think we are a nation that really believes in a helping hand, in the generosity of connecting with friends, neighbors, and strangers to give them chance they might not otherwise have." The Hillary quote came from a speech Clinton gave at Dartmouth College over the Fourth of July weekend, during which the presidential candidate detailed her mother's struggles growing up. But let's not take the photo at face value. 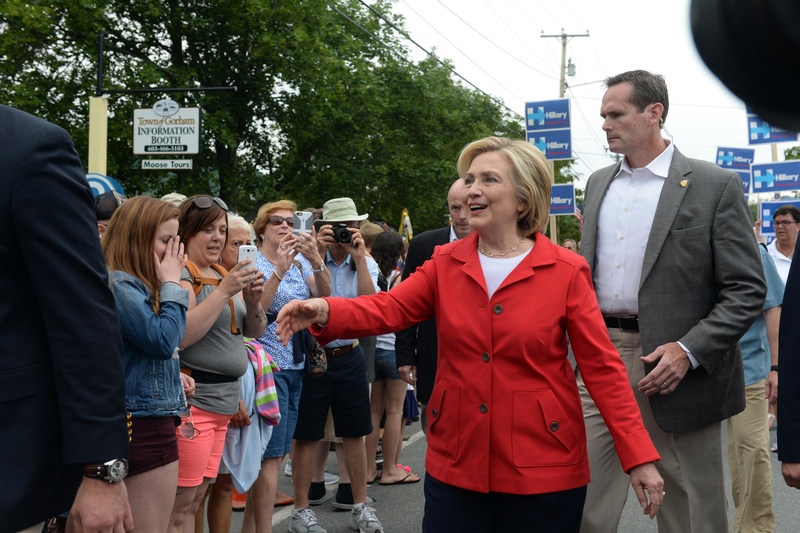 Clinton was shaking lots of hands that day, and this unfortunately became the snapshot her campaign chose to represent the "every American" candidate meeting with normal folks outside a Dairy Twirl. According to BuzzFeed, the Clinton camp said the tweet and photo were "removed out of caution after people pointed out the tattoo." OK, so let's acknowledge that Clinton's Twitter isn't solo-managed by her. She obviously has a team of people running the Twitter machine on her behalf. But that's what makes the mistake that much more ridiculous. You can bet someone got fired for this. Or at least, a fierce tongue lashing. Once again hawk-eyed Twittizens, thank you for capturing and saving every "oops" moment coming out of this election circuit circus.